Teachers demonstrating lesson on child motivation, appreciating a teacher for her work. Nadia Riasat, Facilitator, responding to a question on action planning. A Teacher delivering a model session by engaging other teachers in a group activity. A group sharing their presentation during delivery of model lesson on Mathematics by a teacher. Rubab Shah, TEO, Thatta, awarded certificates upon the completion of the 5-Day training to the participants. Teachers observing classroom in field during a class on a field visit to a primary school in Thatta. “One can never learn enough”, it is often said and heard. The same applies to teachers; teaching and learning is a continuous process that goes hand in hand. Learning new methods and understanding the process of teaching leads to better teaching practices. Passionate teachers understand that the greatest benefit of trainings to them is the large number of additional skills they acquire, allowing their lessons and classrooms to be more interactive, interesting and informative for their students. For many teachers, making a positive difference in the lives of students is most valuable – the feelings of self-satisfaction as you watch your students grow and succeed due to your hard work and dedication in the field. 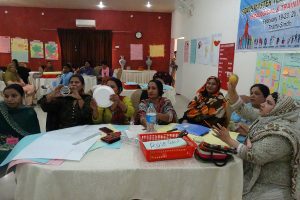 To give an opportunity for such teachers to continue feeling valued, Community World Service Asia organized and conducted a five-days master teachers’ training on pedagogical & training skills under the Girls Education Project supported by partners, Act for Peace, in Sindh province, Pakistan. 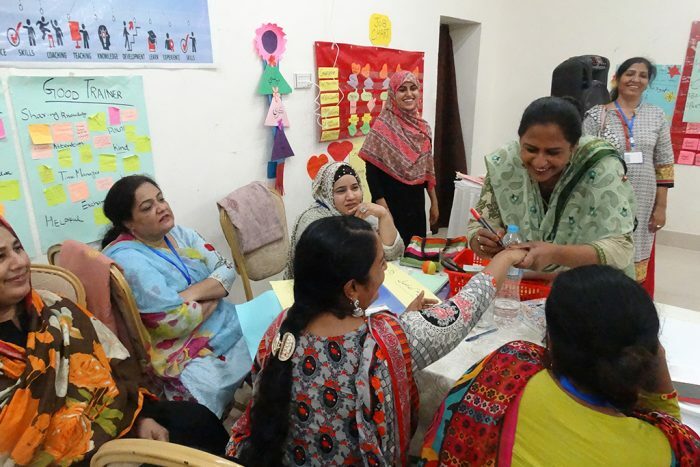 After successfully completing three teacher training cycles on pedagogical skills in the Thatta district of Sindh, this training was categorized as an advance level for those teachers already trained. The five-day sessions aimed to strengthen teachers’ capacities on adult learning, teaching methods, professional teaching standards and lesson planning on daily, weekly, monthly and basis. Twenty-five teachers from twenty government primary schools of Thatta participated in this workshop. 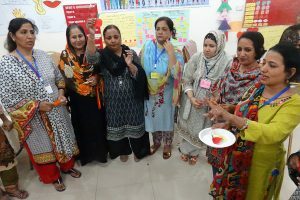 As a training of trainers of sorts, the purpose of this workshop was for teachers to develop specific expertise on developing model lessons and classrooms and further mentoring teachers in their respective schools on quality teaching methods and techniques. Sessions on adult learning theory, types of learning styles and creative teaching methods were conducted for teachers where they were also specifically guided on ways to address learning needs of students as per their dominant learning style. Moreover, the need and importance of lesson planning was emphasized in the training sessions as it was realized that teachers often overlooked that and did not recognize the many benefits of this activity. The teachers were taught on how to develop lesson plans at different stages of their yearly activities. During the training, the teachers’ skills on class observation tools, reporting and delivering model lesson in schools was enhanced with a particular objective of increasing class participation and students’ involvement in practical learning. 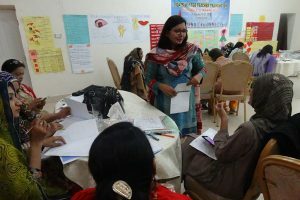 As part of the five-days workshop, the 25 teachers were taken on a field visit to a government primary school in Thatta. As one of activities, participants were required to observe teaching methods at the host school and record their observation on the checklist provided by the facilitator. Teachers also observed practical and learning environments seen in different classrooms and later discussed and delivered group presentations on the gaps recorded during the visit. One key observation from the field was that since there was no lesson planning, the lessons lacked clarity of flow and were ineffective and uninteresting for the students. Teachers, with the support of the trainers, were asked to develop “model lessons” on the gaps observed during the field visit and deliver them as part of a group exercise. Some of the topics presented by the teachers included child motivation; classroom managements; and less responsiveness by teachers. Participants also developed action plans as part of the exercise, to implement active and practical learning in their schools. As a follow up to the training, the graduate master teachers planned to conduct these “model lessons” in their respective schools and would share its calculated impact with the facilitators of this training. These innovative trainings on pedagogical and training skills have been very significant in delivering quality orientated lessons using interactive methods. I am glad to say that I have noticed visible changes in classrooms post such trainings as teachers have developed low cost learning material with and for the students. “I am happy to attend this training as I have acquired new knowledge that will help me in becoming a good teacher. The best part of the training was its methodology and taking us on a school visit and then helping us in developing model lessons. 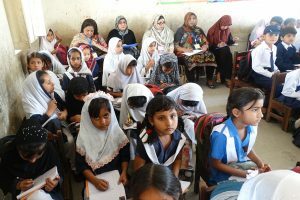 I was a bit hesitant in delivering lessons as a master teacher in front of all other teachers but the facilitators encouraged me and I delivered complete lessons successfully.” Seema, Primary School Teacher at Government Girls Primary School (GGPS) Muhammad Hanif Khushk. “I believe such teachers’ training help a lot in improving classroom environments. Its adding to my experience as we get new opportunities to learn from other teachers’ experiences by interacting with them. 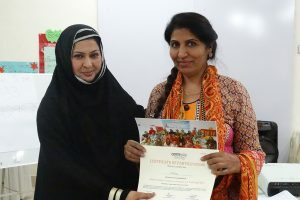 The action planning section will help us immensely in improving our lesson planning and managing classes effectively.” Nasira Parveen, Primary School Teacher at Government Girls Primary School (GGPS) Jeelani Muhalla School.